How does the optimal f-stop for sharpness change when adding extension rings? For example if I add the whole kenko set of extension rings to 100 mm macro (with optimal sharpness at f-stops 5.6 - 8.0), what would then be the best f-stop to obtain maximum sharpness? I also wonder if there is a simple way to figure out how extension rings affect the sharpness of the photo (sides, corners)? Any help appreciated very much. Trials will be a better predictor than theory! A "perfect" lens would be sharpest at its widest aperture, but lenses aren't perfect. You're probably getting outside the designed magnification range of the lens, and diffraction will start to become a significant negative factor as you increase magnification and reduce aperture. I would have to think that the optimal f/stop for a lens is not dependent on the amount of tubes used. But diffraction due to a higher effective aperture from using tubes to increase the magnification would cause a loss of sharpness. Ideally testing would be best. But for starters keep your effective f/stop around f/22 or less. Effective aperture = nominal aperture (the aperture you set the lens to in your camera) * (magnification + 1). Also, sometimes you have to say "To hell with sharpness." because you need more depth of field. Having a really sharp image with very shallow depth of field is not that great. Keep in mind that proper lighting goes a really long way in improving the captured image. What do you have for a light source? Are you using your setup in the field? Hand held? Or in the studio? I would have to think that the optimal f/stop for a lens is not dependent on the amount of tubes used. Well, remember that adding tubes changes the focus relationship, which changes the amount of certain aberrations. In some cases there can be a significant increase in aberrations, pushing the optimum aperture a couple of full stops smaller than it is when used in the lens's normal design range. An extreme example is to extend a normal 50 mm lens designed for long distance focus so as to give 1:1. Most likely the image will be quite poor until you've stopped down to nominal f/11 or f/16, effectively f/22 or f/32, even though when used normally the lens is probably sharpest around f/5.6. The change will probably not be that much in this case, but some test shots are definitely in order. Thanks for your replies. I'll try to figure out how to arrange a suitable test. I will be using Canon EOS 5D Mark II, Canon EF 100mm f/2.8L Macro IS USM with/without Kenko Macro Extension Set 13mm+20mm+36mm and will do the test in Live View using remote control. I think I need to test also some other stuff like mirror lock-up and EFSC. I have been using those but don't really know if and how they affect the overall sharpness. I guess there is no shortcut here but have to test and see myself the differences. Would a standard printable testcard be OK or are there testcards designed for testing specifically macro setups? Maybe a sheet of newspaper glued to a flat surface would be enough? FOV in the tests will be 15 to 26 mm. "Keep in mind that proper lighting goes a really long way in improving the captured image. What do you have for a light source? Are you using your setup in the field? Hand held? Or in the studio? " I have a small studio setup with full spectrum lamps. It is very basic and I don't use flash. I am using stacking software while shooting in studio but I also like to shoot handheld in the field. I am hoping to eliminate the unnecessary softness from my photos, like using wrong optimal f-stop with extension tubes and other basic mistakes. I have also been eying Nikon Plan 10x/0.25 ~/- WD 10.5 Objective after reading here about it. I could use it with my 100 mm macro but if I have understood this correctly then it is nonoptimal 5x and I need to use extension tube to make my 100 mm 200 mm. So here is another related question I have been wondering: is this a bad idea and would I unnecessarily loose some sharpness using 100mm + extension tube as compared to using 200mm objective as a tube for the Nikon 10x. Canon EF 100mm f/2.8L Macro IS USM with/without Kenko Macro Extension Set 13mm+20mm+36mm and will do the test in Live View using remote control. I've tested that same lens on a different camera: Canon T1i with APS-C sensor. If I recall correctly, it did OK on extension tubes if the lens itself was set to close focus. 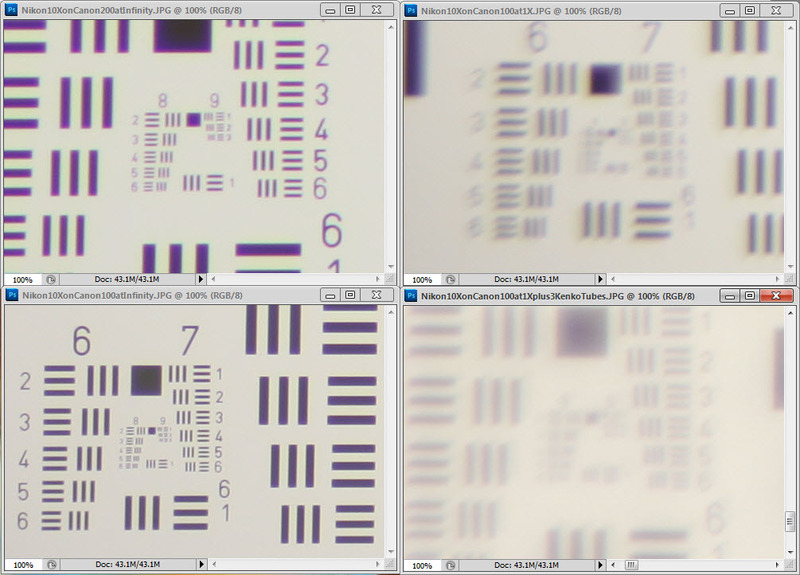 But if the lens itself was set to infinity focus, then adding extension tubes degraded the image quite a bit. The idea I had in mind at the time was to add extension tubes so that the lens+tubes would no longer focus at infinity but instead would cover a range of maybe 0.6-2X. But I gave up on that idea because of image degradation at the low end (when the lens itself was focused near infinity). Instead I switched to either adding a high quality closeup lens in front or a teleconverter behind. Adding a 1.4X teleconverter behind works especially well because it retains infinity focus and also can reach 1.4X on sensor. See HERE for an example. If you had an APS-C sensor, then sticking the 10X in front of your 100 mm macro would give a very sharp combination (with the 100 focused at infinity!). The problem with using that combination on full frame is that the corners will go bad because the objective does not cover an 8.6 mm field (43 mm sensor diagonal, divided by 5X). What you propose turns out to be a really bad idea. Before explaining, let me illustrate. Upper left: Canon 55-200 mm f/4.5-5.6 at 200 mm focused at infinity. Upper right: Canon 100 mm f/2.8 macro, focused at 1:1. Lower left: Canon 100 mm f/2.8 macro, focused at infinity. Even at this scale, you can see that the image with tubes added is severely degraded. At this much closer scale, I think it's obvious that focusing those rear optics any place except near infinity is a bad idea -- a Really Bad Idea. When the rear optics are focused at infinity (left side of this panel), we get a clear image corner to corner. But when the rear optics are focused far from infinity (right side of this panel), we get junk. and I need to use extension tube to make my 100 mm 200 mm. I think I'm hearing a serious misconception hiding in there someplace. Adding extension tubes to a 100 mm lens can never get you a 200 mm lens. At best it can get you a 100 mm lens whose optical center is positioned 200 mm away from the sensor. But then the lens is not focused anywhere near infinity -- in fact it's focused only 200 mm in front -- so when you stick a microscope objective in front of it, you're asking the objective to work in a focus arrangement that it was never designed for and doesn't handle very well. Thanks Rik for your very generous answer. I appreciate it very much. Hopefully my questions and mistakes, which you kindly pointed out, help also others in the beginning stages of macrophotography. I am not native in english, have no experience with microscopes, have no background in photographing, and struggle with the technical vocabulary needed. So it is a bit of a challenge to even phrase the right questions. What I wanted to ask is whether Nikon Plan 10x/0.25 ~/- WD 10.5 Objective would work fine with my 5D Mark II + Canon 100mm f/2.8L Macro if I added a 2x teleconverter to make it 200mm. I just vaguely know that there are things like aberration involved here. 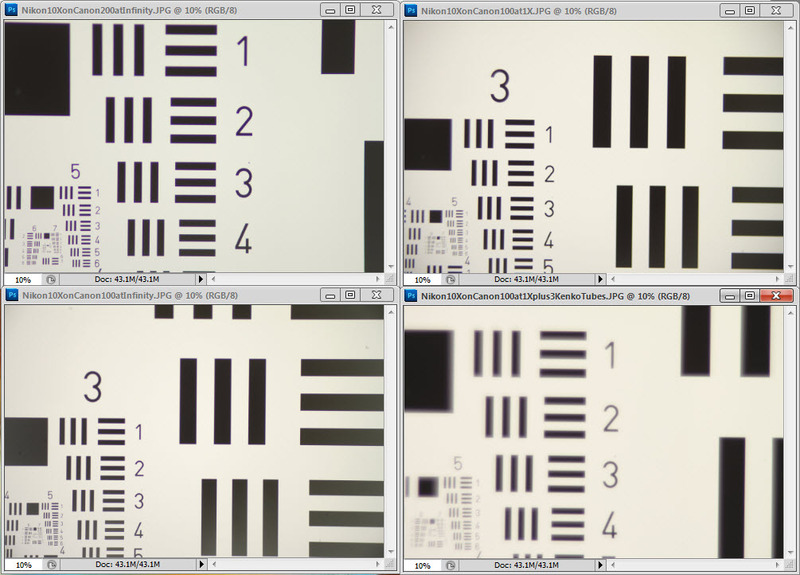 Basically I am just trying to figure out what would be the best way for me to move from 1:1 to higher magnification. I guess it is the same question all beginners must figure out. I have to do a lot of reading now to fully comprehend all the info in your answer. Fortunately this wonderful site is a treasure of information for a beginner like me. I sympathize on all counts. You're doing great. What I wanted to ask is whether Nikon Plan 10x/0.25 ~/- WD 10.5 Objective would work fine with my 5D Mark II + Canon 100mm f/2.8L Macro if I added a 2x teleconverter to make it 200mm. Yes, this will be OK assuming that the 100 macro and the 2X teleconverter play nicely together to give you a clean image at infinity focus, without the microscope objective in place.